"Mixed-use" describes a land development containing two or more major types of uses (typically including residential, commercial, office, and institutional), each of which should attract a significant market share in its own right. Mixed-use has evolved incrementally over time in areas, but is also a more recent, specific form of development. Mixed-use reflects a physical and functional integration of its various components, which can be provided within a vertical mix of uses into a single mixed-use building, the planned positioning of key plan components around a central public space or land use (for example, a shopping center), or through a town center/urban village setting that interconnects uses through pedestrian friendly facilities. Mixed-use frequently involves stacking uses, usually residential or office uses over retail uses. The scale of mixed-use is highly dependent on the contextâ€”from a single urban parcel to the redevelopment of a collection of parcels within or adjacent to a developed area. Municipal zoning ordinances can permit and regulate mixed-use land uses. Municipalities need to first determine where mixed-use should be permitted and create, or amend as necessary, ordinances to ensure that they permit and encourage the use. The details of the ordinance must reflect the form of mixed-use that a community is looking for, whether individual parcel infill or a completely new town center. Ordinances should provide for opportunities for the use of shared infrastructure and amenities, such as common parking and stormwater management facilities, which can be more cost effective and environmental friendly than providing similar facilities for uses on an individual basis. New development of mixed-use town centers are typically organized around a street, pedestrian and public space network to function more like an urban area than a single development project. Large scale mixed-use development projects may require public/private partnerships to address issues such as roadway improvements required outside of the immediate project area for successful project implementation. These projects benefit from an initial feasibility analysis, along with appropriate marketing, promotion and operational management. Energy conservation-mixed-use development inherently conserves energy because it promotes efficient land use, reduced reliance on the use of vehicles, and establishes walkable communities based on Smart Growth principles. Create a sense of place in a community. Achieve higher densities while creating more amenities, and usable and pleasant public open space, which sometimes cannot easily be achieved by single-purpose projects. Can result in shared infrastructure (ex. parking), thereby making possible economies of scale in development and operating costs. Achieve greater long-term appreciation in land and property values. Stimulate revitalization by encouraging redevelopment activity in downtowns, and urban and suburban infill locations. Provide a focus for growth in more suburban communities. Provides opportunities for increased use of public transit. Work in conjunction with tools such as Effective Agricultural Zoning or as a receiving area for Transfer of Development rights to promote growth in the most appropriate areas in conjunction with existing or planned infrastructure including, but not limited to public water and sewer facilities. It requires attention to detail in all aspects of its design, to avoid replicating sprawl. Mixed-use development can require additional administration, due to the complexity of development regulations. The municipal zoning ordinance regulates the variety of uses permitted within a zoning district. The evaluation of areas suitable to be zoned for mixed-use should address issues such as scale, size, access and visibility, proximity to other land uses, public transit opportunities, and existing utilities and infrastructure. Areas must allow for relatively high-density development of multiple uses and should be located in proximity to existing travel patterns and numerous access points. Potential mixed use areas should be situated within a centralized area of different uses and activities, providing the area with proximity to multiple land uses to facilitate appropriate infill development or new development that interrelates with adjacent existing development. Traditional Neighborhood Development (TND) and Form Based Codes are two zoning types that can be utilized within a zoning ordinance to encourage mixed use development. Depending on the scope of a community's vision for mixed-use, a municipality may need to amend its zoning ordinance so that use, area and bulk, design and environmental requirements can adequately manage development activity without being overly burdensome upon a developer. Consideration should be given to creating either a new mixed-use land use category or mixed-use zoning district. Design guidelines addressing all aspects of site design (area and bulk requirements, vehicular and pedestrian standards, landscaping, signage, lighting, etc. ), should be specifically developed for this use. Consideration should also be given to streamlining the review process to allow the approval of mixed-use development in a reasonable time frame. Eagleview Town Center, Uwchlan Township: The Eagleview Town Center is a focal point of the Eagleview development in Uwchlan and Upper Uwchlan Townships, situated on the west side of Route 100 south of Interstate 76 (the Pennsylvania Turnpike). 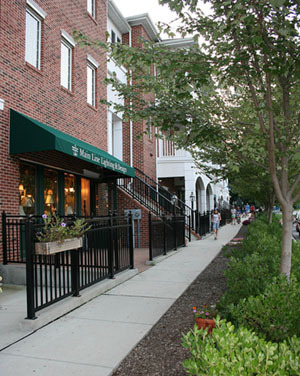 The Town Center contains a mix of restaurants, retail shops and residential units surrounding a two-acre park. Uptown Worthington, East Whiteland Township (in progress): The Uptown Worthington project, situated on the 100 acre site of a former steel factory located on the southeast corner of Route 202 and Route 29 in East Whiteland Township, is being developed as a mixed-use development containing a mix of residential units, retail services and office space within a town-center setting. 124 Marketplace in West Chester Borough: The 124 Marketplace mixed use development is currently under construction at 124 East Market Street in West Chester Borough, and includes a five-story building containing 88 one and two bedroom rental apartments above 10,000 square feet of first-floor retail space. The Borough's Town Center - Retail overlay zoning district permits restaurant, retail and service land uses on the first floor and multi-family dwellings on the upper floors. Occupancy is scheduled for the winter of 2014. East King Street, Malvern: Plans call for residential and retail buildings with parking underneath and behind buildings on nearly five acres and 1200 feet of frontage along King Street in the heart of Malvern's business district. Article VI–Zoning, Pennsylvania Municipalities Planning Code Section 603.(c). (5) includes provisions to encourage innovation and to promote flexibility, economy and ingenuity in development, including subdivisions and land developments as defined in this act. Financing Mixed-Use Development in the Delaware Valley Region, Delaware Valley Regional Planning Commission (2008).